MAZATLÁN, Mexico (Oct. 17, 2011) – Rich heritage takes center stage during the Mazatlán Cultural Festival, kicking off the fall travel season October 20 – December 17, 2011. This vibrant celebration of the arts features 44 days of performances showcasing more than 1,700 artists from around the world. A full schedule of activities ranges from opera, ballet, folkloric and contemporary dance to film, concerts, art exhibits, poetry, children’s theater and more. Staged in unique venues throughout the destination’s charming historic district, many highlights of this year’s festival program are free of cost to attendees. Resonating with the destination’s picturesque coastal backdrop, the central motif of water elements is woven throughout the 2011 Mazatlán Cultural Festival program. The city, affectionately known as “The Pearl of the Pacific,” is located along sixteen miles of golden-sand beaches on Mexico’s Pacific Coast. The Cultural Festival opens on October 20, featuring a Taiwanese group of percussionists in the performance Sound of the Ocean, staged at the landmark Teatro Angela Peralta (Angela Peralta Theater). Located in the heart of Old Mazatlán, this 19th-century landmark has been lovingly restored to its original grandeur by the city and its residents. With its fanciful neo-classical architecture and modern comforts, the Angela Peralta treats audiences to all kinds of performances throughout the festival. New for 2011, Angela Peralta hosts vibrant orchestral performances by the Sinaloa Symphonic Orchestra of the Arts as part of the Mazatlan Cultural Festival. Arts aficionados applaud highlights like these below. For a full 2011 Mazatlán Cultural Festival program, visit www.gomazatlan.com. October 28 Tribute to Fernando Valadés Lejarza – Members of the prestigious Colegio de Sinaloa celebrate the famed Mazatlecan singer, songwriter and poet whose support of cultural arts and cinema left a powerful legacy. The tribute also commemorates the twentieth anniversary of the college’s academic founding as a visionary center for science, culture, arts and research. November 1 Day of the Dead Callejoneada Street Stroll – Discover how this centuries-old tradition is celebrated in Mazatlán during visits to “Altars of the Dead” on display at heritage sites, museums and art galleries throughout the lively Historic District. The walking procession follows “La Muerte” amid costumed dancers, acrobats and musicians led by a donkey-pulled cart, ending at the park-lined Plaza Machado in the heart of Colonial town. November 6 Ballet Folklorico – This performance from the Institute of Culture, Tourism and Art of Mazatlán recounts Mazatlán’s origins and history through vibrant costumes and artistic movement accompanied by live musical performers. Trace the path of the destination’s Colonial era and the grandeur of its golden age to the revitalization and rich culture of modern-day Mazatlán. November 13 Gordon Campbell and OSSLA in Master Concert – A major highlight of the Mazatlán Cultural Festival, this musical concert features the Sinaloa Symphony Orchestra of the Arts directed under the baton of acclaimed maestro Gordon Campbell. November 15 A Taste of Mexico´s Classic Music with Oscar Gómez – National opera star Oscar Gómez celebrates his return to the stage after an 11-year hiatus during this performance of Italian opera classics and traditional mariachi music. Joining Gómez are regional and local musicians from the Traditional Ensemble of the Sinaloa Symphony Orchestra of the Arts, the Ballet Folklórico directed by Javier Arcadia, and soloists from the Escuela Superior de Canto. December 8 Paté de Fuá in Concert – This nationally renowned group of Mexican and Argentinian musicians host a live, open-air concert in Mazatlán’s picturesque Plaza Machado in the heart of the historic district. Fusing alternative rhythms with a repertoire that ranges from accordion, banjo and horns to guitars and double bass, this live performance is sure to keep music fans moving. 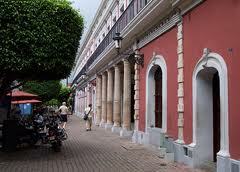 Mazatlán is located on Mexico’s Pacific Coast at the foot of the Sierra Madre Mountains. As Mexico’s second largest coastal city, Mazatlán has nearly 440,000 inhabitants. The city is divided into two main areas: Old Mazatlán or Historic District and Zona Dorada or Golden Zone, with a seven-mile coastal road between the two. Mazatlán has an international sport-fishing reputation. Sites of interest include: the Angela Peralta Theater, Archeological Museum, Plazuela Machado, Sea Shell Museum, Mazatlán Aquarium, The Cathedral and the world’s second-tallest lighthouse. Transportation is available via the local “pulmonías” or four-person open-air vehicles that have become a symbol of the city. Visit Mazatlán on the World Wide Web at www.GoMazatlan.com.